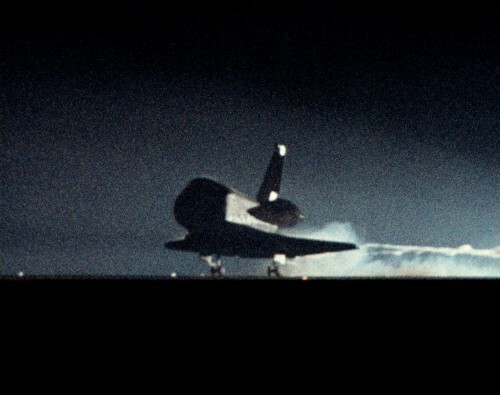 Columbia swoops like a bird of prey into Edwards Air Force Base on 18 January 1986, just 10 days ahead of the Challenger tragedy. Commander Robert “Hoot” Gibson would later refer to this mission as “The End of Innocence” … for after Challenger the shuttle program would never be the same again (Credits: NASA). One of the primary objectives of RCA’s Bob Cenker was to observe the deployment of the powerful Satcom Ku-1 satellite (Credits: NASA). For Cenker, who had served as RCA’s manager of systems engineering for the Satcom-K, it was “his” satellite and his technical responsibility. RCA paid NASA $14.2 million to launch Satcom K-1 on Mission 61C, and the satellite’s 16 transponders were expected to provide coverage of the entire contiguous United States. Confusingly, the second Satcom-K (“K-2″) was launched aboard Mission 61B, before K-1, and physically the satellites differed from many of their predecessors, in that they were cube-shaped, carried wing-like solar arrays, and were also much heavier. In fact, at more than 4,200 pounds (1,900 kg), the Satcom-Ks were several times heavier than most other commercial communications satellites previously deployed by the shuttle. This demanded a more powerful version of the Payload Assist Module (PAM) booster. Enter the new PAM-D2, which could accommodate heavier payloads measuring up to 10 feet in diameter, as opposed to just over six feet for its predecessor, the PAM-D. 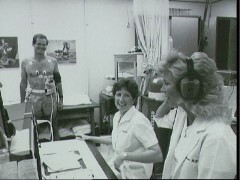 Congressman Bill Nelson undergoes medical tests in the JSC Clinic in September 1985 (Credits: NASA). 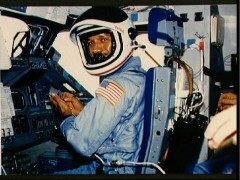 Pictured during preparations for re-entry at his station on Columbia’s flight deck, Pilot Charlie Bolden had learned through experience the intricacies of “Hoot’s Law” (Credits: NASA). 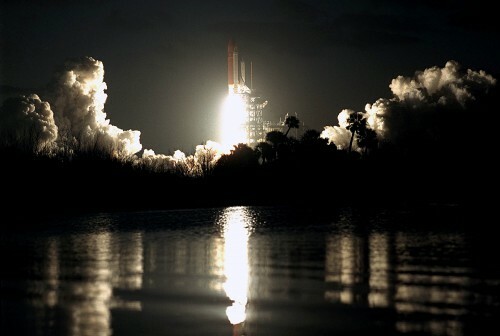 “Mission Impossible” finally launches as Columbia roars into the darkened Florida skies on 12 January 1986 (Credits: NASA). On Mission 61C, launched on January 12, 1986; Space Shuttle Columbia was making her first orbital flight in over two years. Late in January 1984, a month after returning from her STS-9 mission, she was transported from Florida to California for a major program of upgrades at prime contractor Rockwell International’s plant in Palmdale. She received heads-up displays for her pilots, lost her original ejection seats in favor of lighter versions, and was equipped with new instruments—including a tail-mounted Shuttle Infrared Leeside Temperature Sensing (SILTS) pod—to monitor her performance during flight. Returned to the Cape in July 1985, she entered formal processing for Mission 61C in September, by which time the flight’s payload had changed again. The crew would retain their Materials Science Laboratory (MSL-2) payload and gain the Satcom Ku-2 communications satellite and a “bridge” of Getaway Special experiment canisters, but the remainder of their scheduled five days in orbit would be relatively roomy. To 61C crewman Steve Hawley, this provided every reason for NASA to cancel 61C … but for one thing: the presence of Congressman Bill Nelson. Launch was moved to 6 January 1986, and was under considerable pressure to get underway, because the next flight—Mission 51L—was due to fly from the newly-refurbished Pad 39B on the 22nd, carrying New Hampshire school teacher Christa McAuliffe as the nation’s first private-citizen astronaut. NASA also wanted Columbia back from 61C as quickly as possible, because she was booked for the ASTRO-1 mission to observe Halley’s Comet in early March. 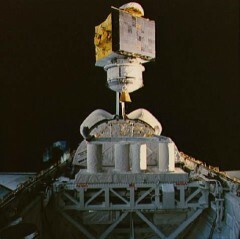 A launch on 18 or 19 December would have allowed just enough time to refurbish Columbia and install a battery of three ultraviolet telescopes for ASTRO-1. Delaying 61C past Christmas and into the New Year was a headache which the space agency could ill afford, but worse was to come. 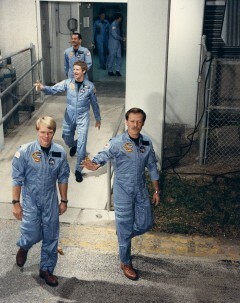 Robert “Hoot” Gibson (right) and George “Pinky” Nelson lead the 61C crew out of the Operations & Checkout Building for launch. Following is crewmate Steve Hawley (Credits: NASA). Columbia’s launch attempt on 6 January turned out to be one of the most hazardous yet in the shuttle’s five-year operational history. The count was halted at T-31 seconds, following the accidental draining of almost 4,000 pounds (1,800 kg) of liquid oxygen from the External Tank! The fill and drain valve, it seemed, had not properly closed when commanded to do so. Launch controllers reset the clock to T-20 minutes and efforts were made to reinitiate the liquid oxygen tanking, but it was quickly realized that time was running out and the window would close before the vehicle was ready. Another 24-hour delay was called. The next attempt, on the 7th, was scrubbed due to poor weather at two Transoceanic Abort Landing sites in Spain and Senegal. As for the cause of the delays, there could be only one person to blame: Steve Hawley. 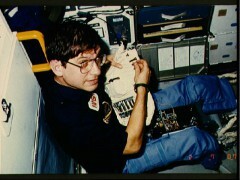 When the astronauts left their quarters in the pre-dawn darkness of 12 January, Hawley had ridden the bus to the launch pad on 10 occasions for only two liftoffs. To this day, he is confident that a conversation and agreement he had with commander Robert “Hoot” Gibson may have helped to finally get Columbia into orbit. “I decided that if [Columbia] didn’t know it was me, then maybe we’d launch,” he said, “and so I taped my name tag with grey tape and had the glasses-nose-moustache disguise and wore that.” It worked and 61C roared into space at 6:55 a.m. EST. Yet misfortune was not done with the crew, as recounted dramatically by Bill Nelson in his book about the flight, Mission. As one of the few black astronauts, there was one particular place that Bolden wanted to see after reaching orbit: Africa. Years later, he would describe it as “awe-inspiring” and it brought tears to his eyes. However, his first glimpse of his ancestral homeland from space would closely mirror the reflections of many other astronauts: for there were no lines or boundaries to demarcate the countries or, indeed, the continents, and Bolden found it difficult to orient himself and realize what he was observing. The cube-shaped Satcom Ku-1 payload—one of the most powerful communications satellites of its time—departs Columbia, affixed to a PAM-D2 booster (Credits: NASA). 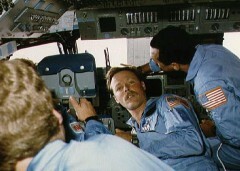 61C crewmen Steve Hawley, Robert “Hoot” Gibson (facing camera), and Charlie Bolden demonstrate the cramped nature of Columbia’s flight deck during the mission (Credits: NASA). Columbia touched down on Runway 22 at 5:58:51 a.m. PST, wrapping up a mission of a little more than six days. Subsequent inspections would reveal severe thermal damage to her right-hand main gear inboard brake, and it was decided that major improvements to withstand higher energy wear would be incorporated before her next voyage, Mission 61E. Coupled with the landing in California, this made the scheduled launch of 61E, just seven weeks later, increasingly untenable. “The landing,” said Bolden, was “uneventful, other than the fact that it really upset Congressman Nelson, because he really had these visions of landing in Florida and taking a Florida orange!” The recovery team at Edwards showed no mercy, and fellow astronaut Dan Brandenstein greeted the crew with a basket of California oranges and grapefruits from the California Growers’ Association! It was a joke that Nelson did not appreciate. Ten days later, he would appreciate, at least, that he had returned alive.